It's always time for polka dots, so with this polka dot design expanding strap and grey floral dial, you are set. It comes in a beautiful printed box. 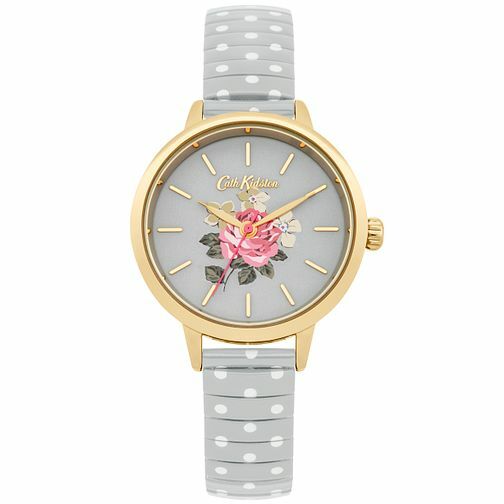 Cath Kidston Ladies' Grey Stainless Steel Expanding Watch is rated 4.7 out of 5 by 7. Rated 5 out of 5 by Anonymous from Lovely pretty watch The watch face is a good size, not too big, and it’s very clear. I love the stretch strap, and it was easily adjusted to fit my small wrist. The colour goes with any outfit. I purchased this online and collected in store in just a few days.